THESE LINES, WARM KIND, AND HOPEFUL, ARE SEEMINGLY ORDINARY—until you realize that they were written in the darkest days of the Holocaust under tyrannical censorship. In Holocaust Postal History, read more about these messages and others, many written just before a final, tragic journey. Holocaust philately, the study of postal means of communication during the Nazi era in Europe, does not provide answers to the major questions that still haunt us. It does, however, offer insight into the personal, unique journeys of victims of the Nazi onslaught. In many cases, an envelope or a postcard, as highlighted in this book, may be the only remnant of an individual’s life. I was deeply moved by these spare but compelling stories. 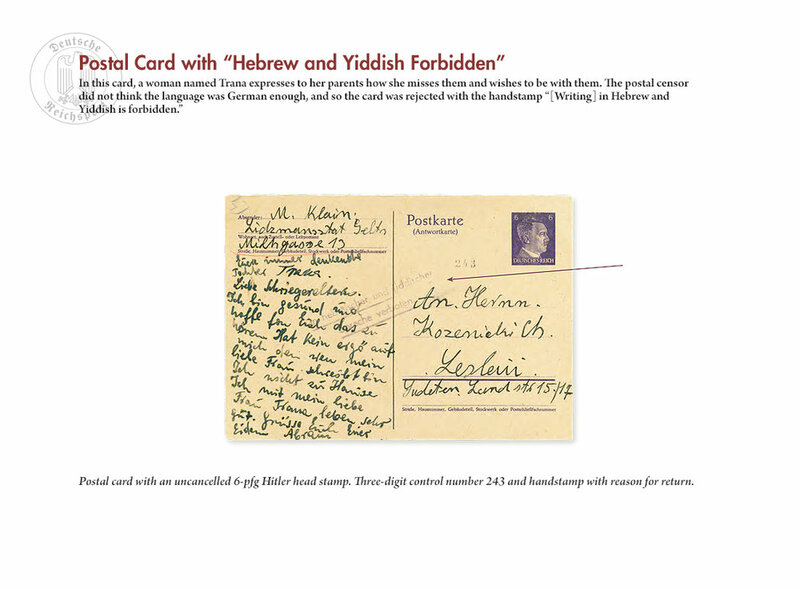 The handwriting in these postcards—along with the pleas for help and family connection—vividly humanizes this horrific event, often seen as overwhelming. I admire the dedication and hard work required to collect and document this important part of history. Justin Gordon’s Holocaust Postal History is a very readable and understandable overview of this tragic period. 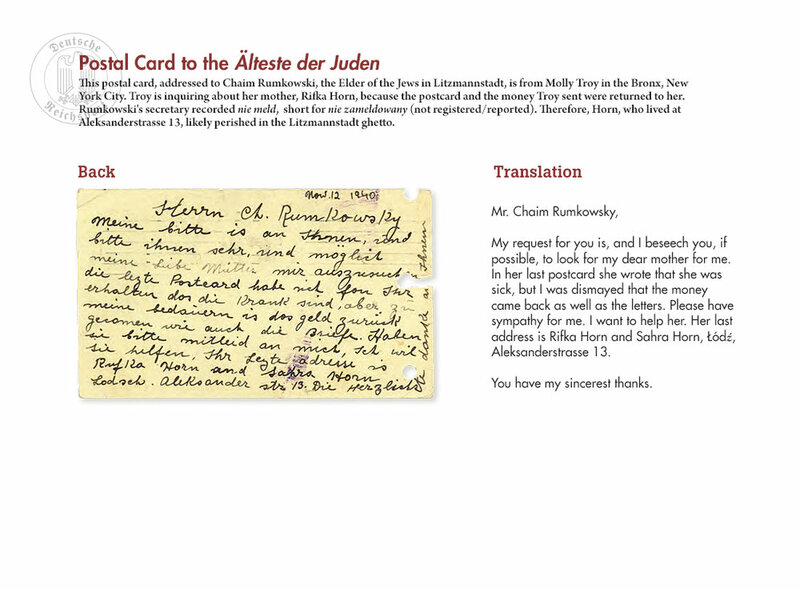 The translations of the messages written by the Holocaust victims bring these events to life. If you are interested in the Holocaust, this book will make a good addition to your library. FOR ME, THIS BOOK REPRESENTS A DUAL JOURNEY—into both the childhood delight of stamp collecting and the adult horrors of Holocaust history. I happened upon both worlds in my youth, and Holocaust philately represents the convergence of the two. As a child I encountered stamp collecting through my uncle, who gave me an album. Then I was introduced to the Holocaust by a cantor who had survived Auschwitz. Even though I left the two worlds for a time, they converged years later at a stamp show in Chicago. I came across a philatelic exhibit that contained documents from Nazi-occupied Poland and cards and letters from Auschwitz and the Warsaw ghetto. I knew immediately this would be my avocation once again. Stamp collecting is, on the surface, about journeys of paper but on a deeper level is about the lives of people. As a postal historian, I collect postal covers (envelopes and cards) with all their markings, enclosures, and attachments. I research these elements to find out more about the cover: its origin, where it was sent, and whether or not it arrived. These markings document the object’s journey and provide clues about those who sent and received it. Over the past 30 years I’ve made hundreds of presentations about these covers. My website, www.holocaustjourney.com, was my first attempt to bring together all of that information. This book is intended to be a permanent, physical record of those talks. As I worked on the first draft of the book, I realized that an important dimension was missing: details about the people who sent or received the covers. 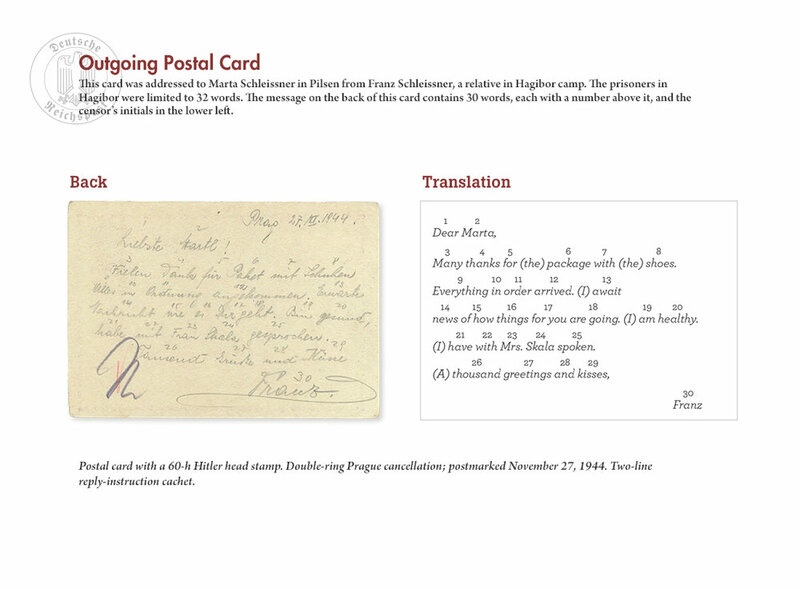 I then began the painstaking process of researching the individuals represented in the cards and letters. 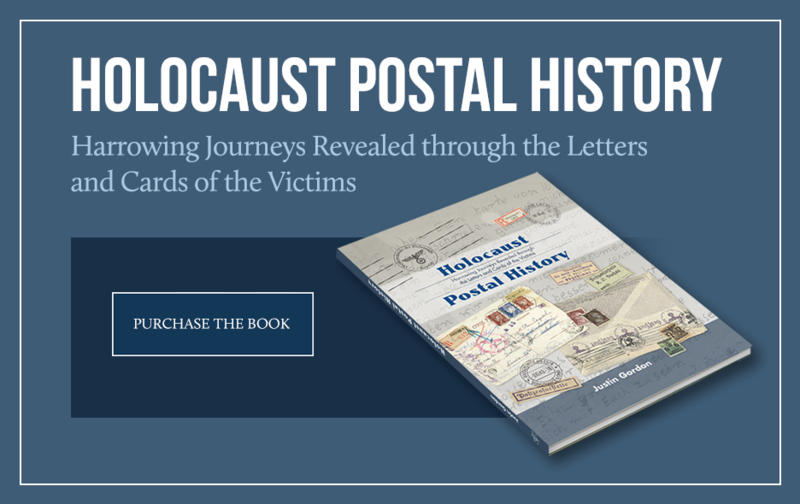 Holocaust Postal History, therefore, is a convergence of its own, documenting not only a dark period in Jewish history, but also the victims’ personal histories. Justin Gordon, OD, is a Holocaust postal historian. 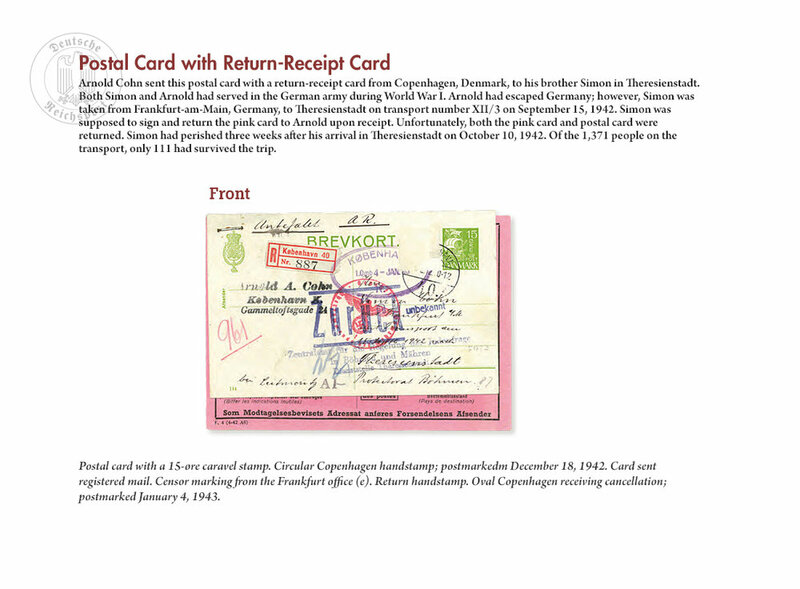 He has collected, exhibited, and lectured on the postal history of the Holocaust for 40 years. He also enjoys photography and baseball. Gordon and his wife live in Chicago and have three children and many grandchildren. IN A WELL-ATTENDED AND SUCCESSFUL LAUNCH PARTY, philatelist and postal historian Justin Gordon presented his new book, Holocaust Postal History: Harrowing Journeys Revealed through the Letters and Cards of the Victims, to the public on Sunday, November 20, 2016, at synagogue Kehilat Chovevei Tzion in Skokie. An audience of over 100 people gathered to celebrate the occasion. Attendees included Gordon’s family, friends, neighbors, business colleagues, patients, synagogue members, Holocaust survivors and their children, and at least one World War II veteran. People lined up to purchase more than 100 books, which Gordon signed that evening. Special guest and radio personality Regine Schlesinger officially opened the evening with a recounting of her experience growing up as a child of Holocaust survivors. She emphasized the need for continued study and writing on the topic, especially as survivors age and pass away. Following Schlesinger’s comments, Rabbi Shaanan Gelman addressed the crowd, weaving an eloquent narrative around the story of a man who escaped Chelmno and returned to his rabbi’s house to relate the unthinkable truth about what was happening to the Jews of Europe. Gordon’s close friend and collaborator Howard Weiss then spoke to the hard work, dedication, and labor of love that the book represents, as well as to the poignancy of holding an actual cover from Gordon's collection, most likely this person’s last communication and the only remnant of his or her existence. Finally, Gordon addressed the audience regarding the book itself, the culmination of years of collecting, research, and writing. 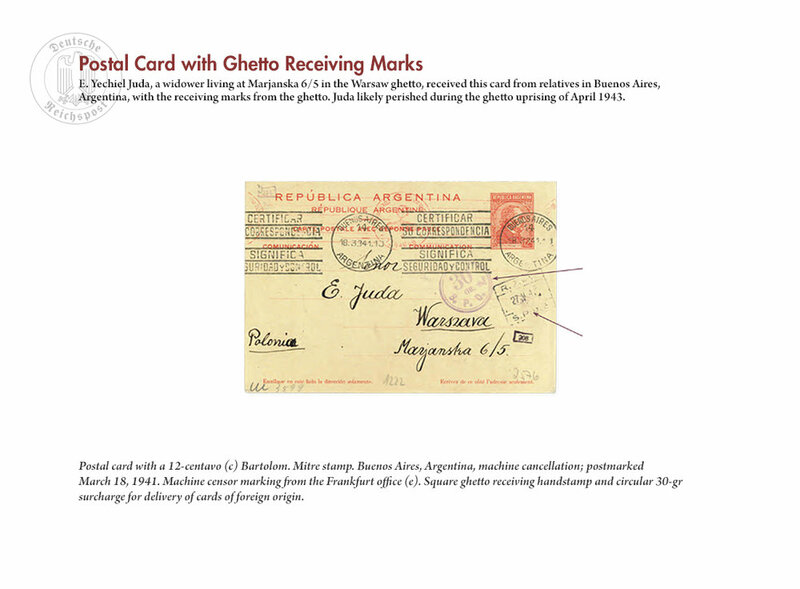 He relayed how his uncle led him to stamp collecting, how his cantor—a survivor of Auschwitz—introduced him to the Holocaust, and how, years later, he’d discovered a convergence of these two areas in Holocaust philately. While his initial motivation for collecting was in the covers themselves and their stamps and markings, Gordon eventually realized that each cover represented a personal journey, a story to be told. His book relates these tales of life and death. Gordon related that his newest project involves collecting covers from each of the members of the first transport to Auschwitz. Following the speeches, Schlesinger opened up time for questions and comments from the audience. One attendee had served in the US troops at the Battle of the Bulge and mentioned that very few French Jews had survived the Nazis in World War II. An elderly Holocaust survivor related that he had just completed his autobiography. Another attendee also asked if the postcards and envelopes in the book could be viewed in a museum. Gordon responded that they are in his private collection and that he would be happy to display it and speak to groups about his research. The event was full of positive energy, and the support for Holocaust Postal History and its author were deeply felt. In all, it was a wonderful beginning to introduce this special book. A poster welcomes guests to the launch party for Justin Gordon’s book Holocaust Postal History: Harrowing Journeys Revealed through the Letters and Cards of the Victims. Author Justin Gordon signs a copy of Holocaust Postal History. Author Justin Gordon discusses his book Holocaust Postal History with an attendee. Howard Weiss, Regine Schlesinger, and Justin Gordon listen as Rabbi Shaanan Gelman delivers his remarks on the horrors of the Holocaust. Author Justin Gordon address the audience, sharing his personal history and reasons for writing Holocaust Postal History. A Holocaust survivor who recently wrote his autobiography addresses author Justin Gordon and the speakers’ panel. Author Justin Gordon and his publishing team: collaborator Howard Weiss, project manager and editor Jennifer Murtoff, and designer Barbara Barg Medley.